Ships today if you order in the next 12 hours 55 minutes. 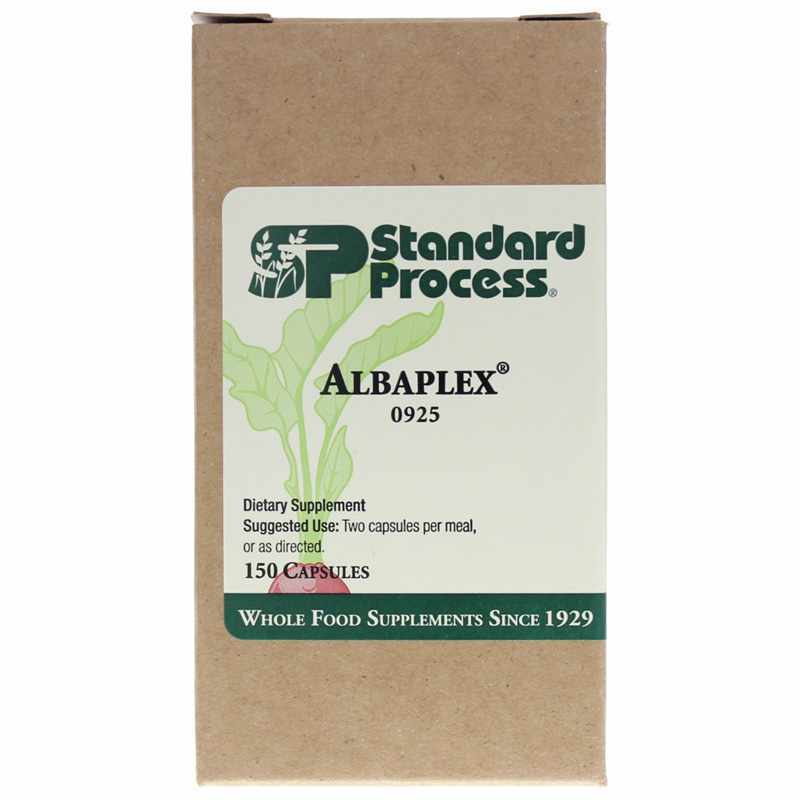 Albaplex by Standard Process is a natural kidney support supplement that supports the natural immune response in the body and healthy kidney function. 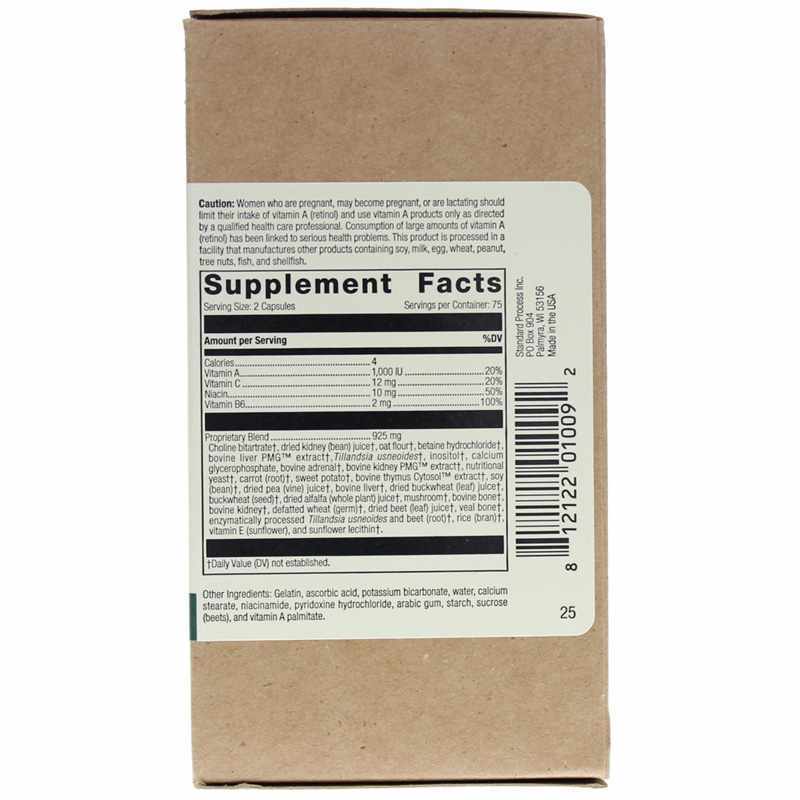 Choline bitartrate, dried kidney (bean) juice, oat flour, betaine hydrochloride, bovine liver PMG extract, carrot (root), Tillandsia usneoides, inositol, calcium glycerophosphate, bovine adrenal, bovine kidney PMG extract, nutritional yeast, bovine thymus Cytosol extract, soy (bean), dried pea (vine) juice, bovine liver, dried buckwheat (leaf) juice, buckwheat (seed), dried alfalfa (whole plant) juice, mushroom, bovine bone, bovine kidney, defatted wheat (germ), dried beet (leaf) juice, veal bone, enzymatically processed Tillandsia usneoides and beet (root), rice (bran), vitamin E (sunflower), and sunflower lecithin. Other Ingredients: Gelatin, potassium bicarbonate, water, calcium stearate, niacinamide, ascorbic acid, colors, pyridoxine hydrochloride, arabic gum, starch, sucrose (beets), and vitamin A palmitate. Adults:Two capsules per meal, or as directed.